E-diagnosis is a method which is provided to help people to get a possible medical diagnosis through E-mail. If you are interested in a possible diagnosis with Traditional Chinese Medicine this is very simple way to get a diagnosis. In Traditional Chinese Medicine, the doctor diagnose the patient by checking pulse, tongue, color, voice, as well as analyze information provided by patients. The doctor also can sometimes find diseases information from patient's hand. There are many lines and marks in one's hands. All of these lines and marks contain recorded life signals and health information about the person. These lines and marks contain many different meanings, and can be indications if a person is healthy or not. Sometimes, color and mark changes in a person's hand may tell people if they suffered from early and late stage tumor or cancer. It can also provide heritage information from genetic overview. 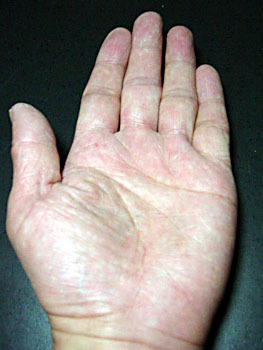 This is the area of focus of e-diagnosis. 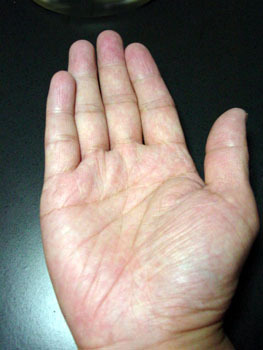 Dr. Liu will need a clear close-up picture of patient's right and left hand, palm up, and he also needs to know whether the person is male or female. He can then provide patient with a health consultation. Dr. Liu received his M.D. degree from China, and has knowledge of both Western and Traditional Chinese Medicine. He also has a strong background in the field of biochemistry and molecular biology. Dr. Liu has practiced medicine for many years, and has diagnosed many patients without being told anything from them. He will send your results to you through E-mail in a few days after having received your information and Payment. Dr. Liu will tell you where you have problems and potential problems and what you need to take to prevent or treat them. To order ediagnosis click the PayPal button for payment, take a picture of your hands, state whether you are male or female, email the pictures to Dr Liu at greentea@ymgreentea.com. In a few days you will recieve your results. Try e-diagnosis today. You will be amazed at the results and you'll possibly feel better for having done so.